We are excited to offer a variety of experiences to campers, with these new additions for Highlander Campers (4th - 6th grades). This is an awesomely messy camp! Campers are placed into groups identified by color. They participate in a week of games and challenges, earning points along the way. The week ends with an "Epic Showdown" and lots of colored powder thrown around. This high energy camp is offered to both Highlander and Middle School age groups. 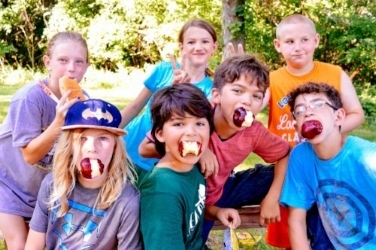 Youth learn the basics of cooking and nutrition in this engaging camp experience. It is a fun, hands-on process where campers learn new skills and participate in an "Iron Chef" type cook-off challenge. In addition, everyone gets to do the usual fun summer activities such as Bible study, horse-back rides, swimming, and games etc. Attendance in this camp will give participants an opportunity to explore nature and how things in God's creation work. It will involve doing science projects, carrying out experiments and addressing engineering tasks. These campers will also participate in "regular" camp activities as well. If you know youth who might particularly enjoy one of these new offerings, please go to our Website for more information and/or to enroll. 60 Years of Camp Ministry! Opportunities to celebrate with us! Join us for our annual TLC Day on Saturday, April 28th from 9 am to 1 pm! On this work day, we prepare for the summer camping season by trimming trails, preparing campsites, and other facilities. Dress comfortably, and you may want to bring work gloves or any tools you would find useful (rakes, shovels, tree trimmers etc.). Coffee and doughnuts and then lunch is provided. Church and youth groups, as well as individuals, are welcome. Through your participation, you will be supporting and blessing our on-going Christian ministry provided to God's precious children. Please let us know you are coming by going to www.heartlandcamps.org/60th-anniversary/ to register by April 25th. Register now for our exciting "6K for 60 Years" fun run. This will take place on May 12 beginning at 8 am here at Heartland Center. Join in the fun of running on many of the camp trails, through the horse pasture, and down "killer hill" [not up!]. The trails consist of dirt, gravel, rough/loose rocks and about 1/4 mile on pavement. 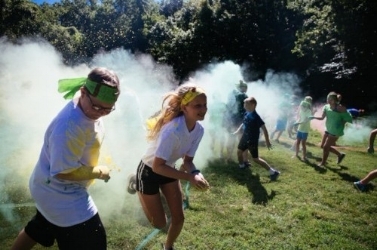 The event is designed to accommodate all ages and athletic abilities. The registration fee is $30 for individuals and $25 for those part of a family of 3 or more. Upon completion of the race, you will receive a short-sleeved t-shirt, an anniversary sticker, a handmade wooden finisher medal and a cinnamon roll! There will also be a 1K family walk/run offered (with no registration fee). Those who want to support Heartland but live somewhere else can participate in our Virtual Race option. To see the route, get additional information and/or register go to our Website and click on Heartland 60th Anniversary under Events. August 3rd-5th - "Staff Reunion Weekend!" August 4th - "60th Celebration Birthday Party!" Heartland Center is seeking a hard-working and reliable person with an appreciation for Christian retreat and camp ministry, housekeeping experience, and time management skills to serve as Lead Housekeeper. The position is 33 hours per week, Monday through Friday, with an opportunity for more hours at different times throughout the year. Join a dedicated team in serving campers and retreat participants with meaningful work. If you have an interest, please send a resume to Hospitality@HeartlandCenter.org. "Thanks for your beautiful building and staff! Amazing place!" "An excellent setting for our meetings. Thank you for your welcome!" "Hospitality is a gift from the Lord. Thank you for sharing your gifts to bless the saints and see God's purpose prosper." "We've been so blessed. We've been well served and enjoyed everything here. What a joy it has been to be with you."